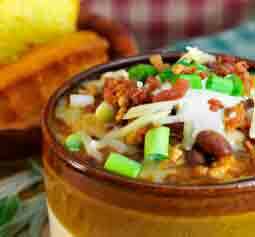 Turkey Bean Chili - A recipe from Savor California, the online showcase for extraordinary gourmet foods and beverages from California. You can prepare this in a Crockpot and let it cook all day. How wonderful to come home to these tantalizing smells. In a large skillet, brown turkey meat in olive oil until tender. Add onion, Garlicsaltless, and Tuscany-Mix. Put beans into Crockpot, add turkey meat, tomatoes, and corn. Add salsa and Mexi-Mix to taste. Stir. Turn on low and let cook all day. This is a recipe loaded with the healthful benefits of fiber, known to help control cholesterol levels. And the best part is there will be plenty left-over for another night’s meal.